The 2013 All-America City Quilt, which has been traveling the country since last September, will be on display at the Peoria Riverfront Museum until Thursday, February 27. 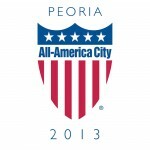 The quilt is being showcased at the Museum alongside a new exhibit featuring a collection of artifacts and items from Peoria's 2013 All-America City award. Each All-America City finalist is asked to submit a quilt square representing something special about their communities. The squares are stitched together into a quilt, which is visiting each of the 20 finalist cities. The All-America City display will remain in the Museum's lobby through the end of March.